French scholar and poet; lived at Carpentras in the second half of the eighteenth century. 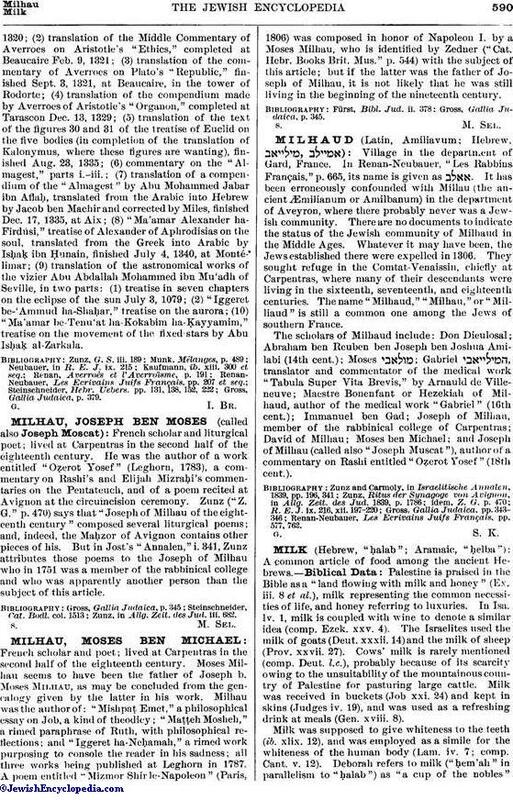 Moses Milhau seems to have been the father of Joseph b. Moses Milhau, as may be concluded from the genealogy given by the latter in his work. Milhau was the author of: "Mishpaṭ Emet," a philosophical essay on Job, a kind of theodicy; "Maṭṭeh Mosheh," a rimed paraphrase of Ruth, with philosophical reflections; and "Iggeret ha-Neḥamah," a rimed work purposing to console the reader in his sadness; all three works being published at Leghorn in 1787. A poem entitled "Mizmor Shir le-Napoleon" (Paris, 1806) was composed in honor of Napoleon I. by a Moses Milhau, who is identified by Zedner ("Cat. Hebr. Books Brit. Mus." p. 544) with the subject of this article; but if the latter was the father of Joseph of Milhau, it is not likely that he was still living in the beginning of the nineteenth century. Gross, Gallia Judaica, p. 345.